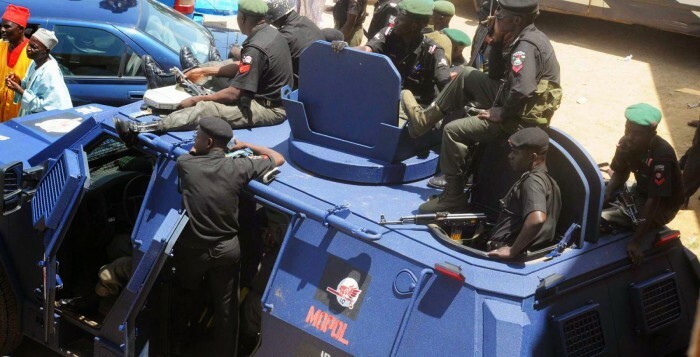 Tension is thick in the air in Kano following the gruesome murder of Tochukwu A. Iro, a patent medicine dealer, who was shot by two men identified as police officers from Kano State Police Command attached to the Special Anti-Robbery Squad (SARS). Igbo youths and traders are protesting the dastardly act. Though the police has called for calm, traders and Igbos in Kano are demanding for justice. Tochukwu (40), married with two children, hailed from Orumba South Local Government Area of Anambra State. Those who knew him described him as a peace-loving man. Tochukwu was shot at close-range on Wednesday at 12 noon, but died Thursday afternoon after a failed operation at the Murtala Muhammad Specialist Hospital. His remains have been deposited in the morgue. According to an eyewitness account, “On Wednesday afternoon, at about 12 noon, we saw Tochukwu walking along the road; as he tried to negotiate Illaro Road, two armed policemen walked up to him. They came with a tinted glass car. They stopped the car close to First Baptist Church, crossed the road and ordered Tochukwu to stop. Briefing the Press on Thursday, Chairman of the Igbo Traders Association (ITA), Chief Em­manuel C. Amadi also demanded justice. According to him, “On that Wednesday, I was attending a market board meeting with the General Manager of Abubakar Rimi Market, security chiefs and other stakeholders when I received a call that one of our mem­bers was shot by the police along France Road. “I immediately told the mar­ket management and they asked me to get more details over the incident. We made arrangements to ensure that he was taken to hospital for treatment. Around 9pm on that Wednesday, I put a call across to Murtala Muhammad Hospital and I was told that he was responding to treatment. “On Thursday morning, I called the hospital and was told that he was taken to the theatre for operation; but it was so sad that this afternoon (Thursday), we got the news that he did not survive the gunshot. As I am speaking to you now, Tochukwu is dead. “I have his file here and I can attest to the fact that he was a peace-loving man. We have never known him as a criminal and that is why we wondered why such an innocent man could be killed in such a gruesome manner. Since the news of his death, we have not rested. “The youths were here in our office this afternoon in protest over the killing of their brother. They are demanding for justice. On our own, we have pleaded with them not to take laws into their hands; and all we are saying is that the killers of Tochukwu must be made to face justice,” he stated. Meanwhile, the Kano State Police Command has reacted to the incident in a statement signed by its spokesman, DSP Magaji Musa Majia. According to the Police statement: “The Kano State Police Command wishes to inform the public that on 27th July, 2016 at about 1200hrs a team of operatives attached to Special Anti-Robbery Squad (SARS), based on tipoff along France Road, stopped one Oguchukwu Augustine ‘m’ of Odutola Street Sabon Gari but he refused to stop. “He was subsequently pursued and while trying to escape, he was shot at the hipbone and immediately rushed to Murtala Specialist Hospital where he gave up the ghost while receiving treatment. “The Commissioner of Police Kano State, Alhaji Rabiu Yusuf, has directed the immediate arrest and detention of the team leader and his men for interrogation at the State CIID Kano. “He also summoned the Elders of Igbo Community in Kano where he sympathises with them and assured that Justice will be done. “The Commissioner of Police also stated that his primary assignment is to protect life and property and will not condone any police personnel who risks the life of innocent citizens.